For our patients in Urbana, MD root canals are tiny passageways that branch off from beneath the top of the tooth, coursing their way vertically downward, until they reach the tip of the root. From our dentists in Urbana, MD root canal therapy is a remarkable treatment with a very high rate of success, and involves removing the diseased tissue, halting the spread of infection and restoring the healthy portion of the tooth. In fact, root canal therapy is designed to save a problem tooth; before the procedure was developed and gained acceptance, the only alternative for treating a diseased tooth was extraction. 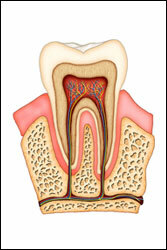 For more information on Root Canals in the Urbana, MD areas call Dr EJ Stringer, DMD & Dr Joseph Mullen, DDS at (301) 831-8303!